I love all sorts of Chinese dumplings, or jiaozi. I can have dumplings every week, as there are so many variations of dumplings. The fillings can be different and you can either boil the dumplings (as in this Pork Shrimp and Napa Cabbage Dumplings, pan-fried or steamed. Either way, dumplings are absolutely delightful. This recipe is one of my favorites, with three key ingredients in the fillings: ground pork, shrimp and napa cabbage. The filling is savory, with a bite of the shrimp and fresh napa cabbage. These dumplings are also extremely juicy, so be sure to sink your teeth and enjoy the juiciness. Chinese dumplings are extremely adaptable. If you don’t eat pork, use ground chicken. If you don’t like shrimp, skip it and add more vegetables. 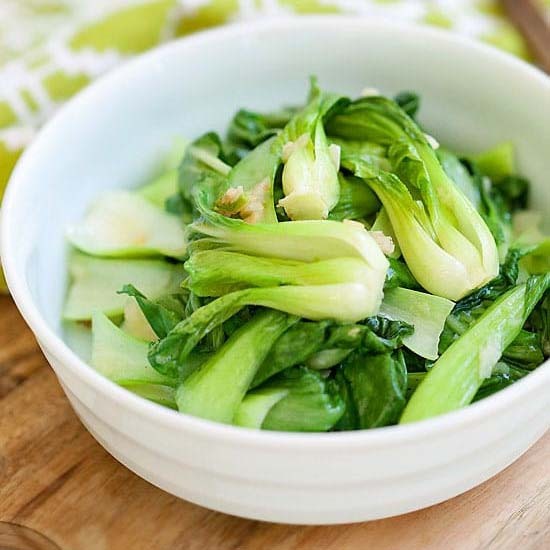 If you can’t find napa cabbage in your store, you may use chives, scallions, or bok choy. If you have never made dumplings, don’t be intimidated, they are so easy to make and there is no special technique or skill needed. Pork Shrimp and Napa Cabbage Dumplings – juicy dumplings filled with pork, shrimp and napa cabbage. 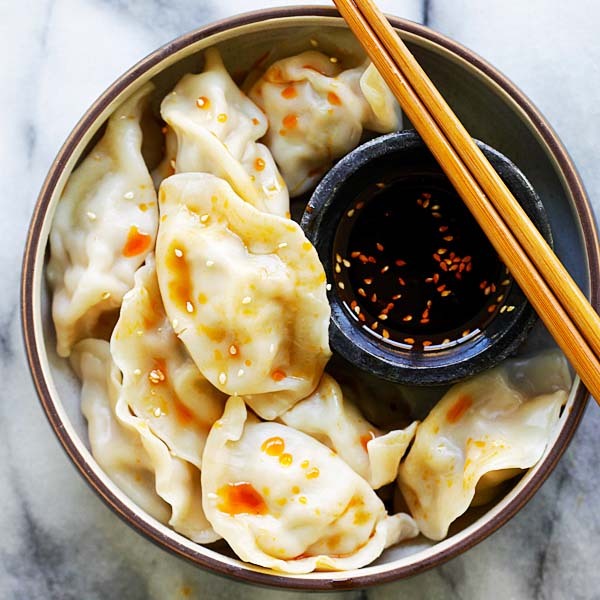 The easiest homemade dumplings recipe ever. Mix all the ingredients of the Filling in a bowl, stir and mix to combine well. Set aside. To make the Dipping Sauce, combine some 1 portion of black vinegar, 1/2 portion of soy sauce, and the ginger in a small sauce dish. To assemble the dumplings, take a piece of the dumpling wrapper and add about 1 heaping teaspoon of the Filling in the middle of the wrapper. Dip your index finger into a small bowl of water and circle around the outer edges of the dumpling wrapper. 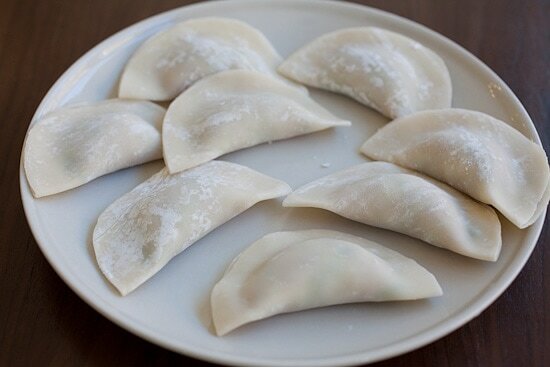 Fold the dumpling over to form a half-moon shape. Finish by pressing the edges with your thumb and index finger to make sure that the dumpling is sealed tight. Place the dumplings on a flat and floured surface to avoid them from sticking to the surface. Repeat the same to use up all the Filling. Heat up a pot of water until it boils. Drop the dumplings into the boiling water and cover the pot. As soon as the dumplings start to float (meaning they are cooked), remove them using a slotted spoon, draining the excess water and serve immediately with the Dipping Sauce. There are different kinds of dumpling wrappers in the market. Choose the ones which are round and labeled as "Potsticker," "Gyoza," or "Jiaozi" wrappers. Do not buy wonton wrappers or Siu Kow wrappers as they tend to be thinner. You may add some ginger strips to the Dipping Sauce, if you like. For the dipping sauce, you can also buy Mizkan Ajipon Ponzu or store-bought dumplings/gyoza dipping sauce. All photos and recipes on Rasa Malaysia are copyright protected. Please do not use the photos and recipes without prior written permission. If you wish to republish this recipe, please rewrite the recipe in your own words instead of copy and paste and link back to //rasamalaysia.com/pork-shrimp-napa-cabbage-dumplings/. Thank you very much! Can I use chicken instead of pork? Do I still use the same amount? Yes, chicken is fine, you can also use turkey if you like, yes, same quantity. Does it have to be cabbage or can I use something else? Can you use other vegetables such as regular cabbage if you don’t like cabbage. You can also omit it if you like. If you like chives you can use chives. Boiled jiaotzi (kuo teh) are great, but I strongly prefer the pan-fried “potsticker” style of cooking them — the browned side, somewhat crispy, is so good. You can turn these into a potsticker. Kuo Teh is actually guotie and it means pot stickers, and not the boiled dumplings. Actually one of the best things I have ever eaten was the Vietnamese steamed dumpling with a sweet meat filling. Made this.. There wasn’t enough flavour to the dumplings, and the meat was a bit dry. Add ginger, chilli & spring onion to your mix, that will give you more flavour..
Chinese dumplings are one of my favorite foods. And these dumplings look delicious, Rasa! Can I make a vegetarian version of this which tastes the same? I am so glad I found you …Again! (long story ?) 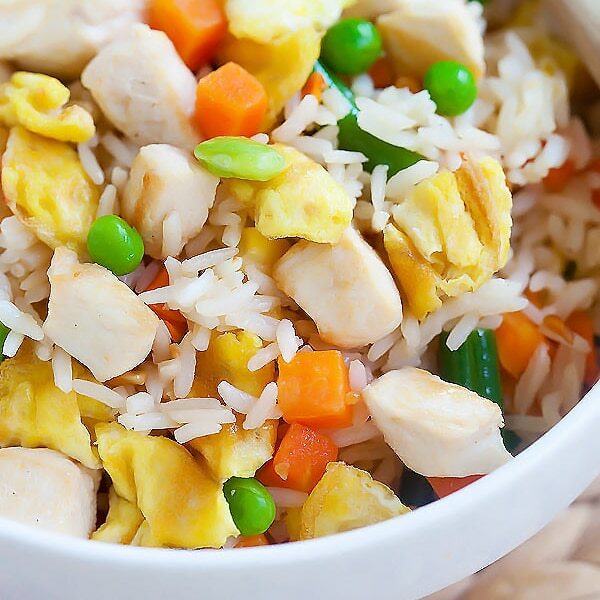 Your dishes are so easy to make and lack no authentic Asian flair at all! I Have always loved Asian dishes and wished I knew how to cook them; they always seemed so complicated though. But you Rasa, have won this African American girl’s heart with your fantastic recipes. Keep up the great work! Oh btw I made your egg foo young and OMG, just as good if not better tasting than the resteraunt! I’m just so used to the brown gravy, but I didn’t miss it. вообще-то,пельмени,русское блюдо а не китайское. Can I just suggest to all reading these posts to READ THE ENTIRE POSTS? She suggests substitutes and what not. Read people don’t be lazy. These are amazing Rasa! Like everything you make. Thank you! ❤? What brand of black vinegar should we buy? Any Chinese brand is fine. If you can’t find Chinese black vinegar, just use Japanese ponzu. These were so good! We fried half and steamed the other half. We did crack one one egg. Very good. These were great and I’m going to make them again! Can you make them ahead of time and put them in the fridge before boiling/frying? Yes you can freeze them before boiling/frying. I love your recipes!!! I’ve been wanting to make dumplings for some time. How come you don’t need to salt and squeeze out the water from the cabbage in these? I love the idea of one less step. It am skeptical of skipping that step. Thank you so much and keep the recipes coming! You don’t need to. This way you will actually taste the crunchy and fresh napa cabbage. I do not enjoy salted napa cabbage.